Jon Andrus and Shane Crotty of Crotty Chevrolet present Brandon Arnink, Jeffery Powell and Brendan Zajac, members of the Corry Little League with new equipment for the upcoming season. In the spirit of community collaboration and teamwork taught through youth sports, Crotty Chevrolet Buick is supporting Corry Area Little League through the Chevy Youth Baseball Program. This sponsorship will include both monetary and equipment donations during the 2014 youth baseball season. Chevy Youth Baseball is a grassroots initiative that establishes a positive relationship between local dealers and the communities they serve. 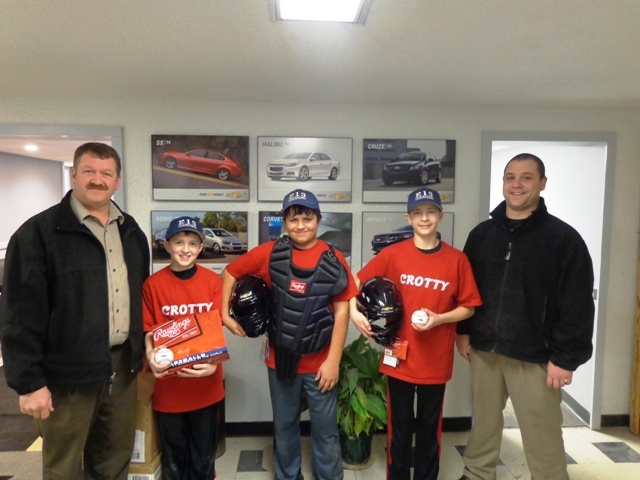 Crotty Chevrolet Buick is sponsoring Corry Area Little League as a part of Chevrolet’s nation-wide commitment to support youth sports, one community at a time. Over the course of the season, Crotty Chevrolet Buick will donate equipment to the league which may include: equipment bags, baseballs, softballs, catcher’s gear, batting helmets, ball buckets, umpire’s equipment, coach’s kits, break away bases, bat racks and first aid kits. Thanks to Crotty Chevrolet Buick and other participating area Chevrolet dealers, youth baseball participants will have a chance to attend a youth clinic with a local professional baseball team. The 2014 program will provide assistance to an impressive 334 leagues in the Northeastern region and Chevrolet dealers will contribute nearly $600,000 in monetary and equipment donations. Crotty Chevrolet Buick, Chevrolet and Corry-area customers will unite for the third consecutive year in the fight against breast cancer. Together with the American Cancer Society, Chevrolet provides nationwide grassroots support of the Society’s Making Strides Against Breast Cancer® walks and other activities. Last year, with the support of Chevrolet, Crotty Chevrolet Buick and dealerships across the country, the American Cancer Society raised $1,211,463 in contributions through the Making Strides walks. This money helps fund research, wellness, breast cancer awareness education and support for breast cancer patients and their families. At the Dealership Crotty Chevrolet has created a “Wall of Hope”. For a donation, a breast cancer symbol is placed on our wall with the name of a loved one or your own name showing support of Making Strides against Breast Cancer. Corry-area customers can also join Chevrolet in the fight against breast cancer just by taking a test drive at Crotty Chevrolet. A $10 contribution per test drive up to $130,000 will be made to the American Cancer Society for every eligible test drives taken nationally on select dates at participating dealerships. Drivers must be over 21 with a valid driver’s license. The promotion is limited to one test drive per person. Additionally, a Chevrolet Certified Service matching rebate promotion on select services encourages Corry-area to contribute their service rebate to the American Cancer Society from October 1 through November 30, with Chevrolet matching contributions dollar for dollar up to $60,000. Chevrolet will also donate $200 for every lap run under caution during select NASCAR Sprint Cup and IZOD IndyCar Series races throughout October. In addition to the donation, a special themed pink Chevrolet Camaro SS will pace select NASCAR Sprint Cup series races. A special 2014 Corvette Stingray will serve as the pace car for the IZOD IndyCar Series event at Auto Club Speedway in October. Those interested in participating in a Making Strides for Breast Cancer walk in their community can visit http://www.makingstrideswalk.org.